If you’re not familiar with the work of Powerman 5000, the American rock group fronted by Rob Zombie’s younger brother, Spider One, you’re probably at least familiar with “When World’s Collide.” If you didn’t catch it on the radio in the late ‘90s, you might have heard it while playing Tony Hawk’s Pro Skater 2. Here’s the video for the song from the band’s Vevo. 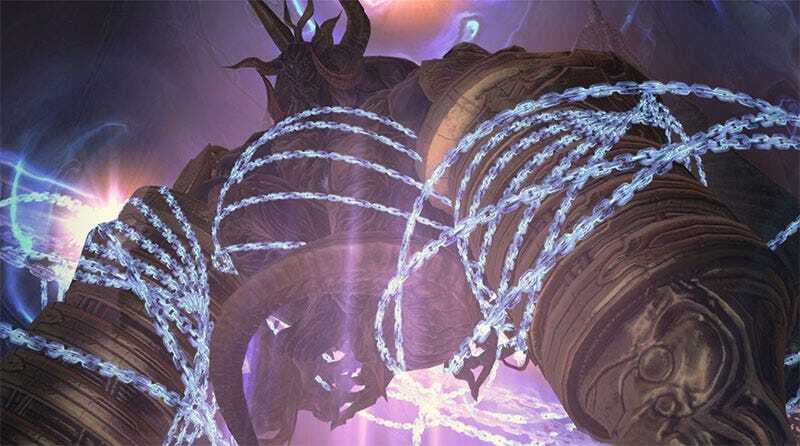 The Final Fantasy XIV music in question comes from the second stage of the newly-introduced boss battle with the fiend Sephirot (not to be confused with Final Fantasy VII villain, Sephiroth). YouTuber Mekkah Dee went through the boss battle with all other sounds disabled in order to capture the tune by itself. There’s no two ways about it, parts of the Sephirot Phase 2 Theme are incredibly similar to Powerman 5000's hit. It’s so close at times that many commenters on the YouTube vid assumed the original poster had simply replaced the game audio with a remix of the band’s tune. Had I heard the music out of context, I would have thought “When Worlds Collide” was about to begin. While it’s not a note for note, word for word rip, the FFXIV music certainly seems heavily inspired by the song, and the band is not happy. A post on the official Powerman 5000 Facebook page (thanks C.J. for the tip!) features Mekkah Dee’s video, along with a scathing admonishment. Its habit of breaking the standard fantasy MMORPG music formula is one of my favorite aspects of Final Fantasy XIV, and contemporary tunes accompanying a big boss battle isn’t new to the game. The boss battle with Titan downright rocks. But if a tune is similar enough to make me remember that Powerman 5000 is a thing, then someone making music for Square Enix might have taken their inspiration a bit too far. I reached out to Square Enix today for comment on their song’s similarities to “When Worlds Collide,” and should they get around to responding you’ll be the first to know. In the meantime, we rock out, like rockers.